℟. Because our Lord is truly risen, Alleluia. 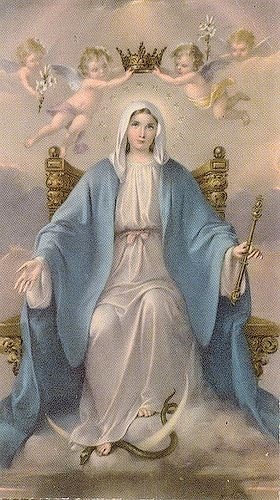 Click here, for prayers to the Blessed Virgin Mary. May 4: FIRST FRIDAY/St. Monica Widow, Double. May 5: FIRST SATURDAY/St. Pius V Pope and Confessor, Double. May 6: V Sunday after Easter, Double; Commemoration of St. John Apostle before the Latin Gate. May 7: Rogation Day (Lesser Litanies); St. Stanislaus Bishop and Martyr, Double. May 8: Rogation Day (Lesser Litanies); Apparition of St. Michael, Greater Double. May 9: Rogation Day (Lesser Litanies); St. Gregory Nazianzen Bishop, Confessor, and Doctor of the Church, Double; Vigil of Ascension. May 10: Ascension Thursday, Double of the I Class. May 13: VI Sunday after Easter, Double; Commemoration of St. Robert Bellarmine Bishop, Confessor, and Doctor of the Church. May 14: Commemoration of St. Boniface (of Tarsus), Martyr. May 19: St. Peter Celestine Pope and Confessor, Double; Commemoration of St. Pudentiana Virgin; Vigil of Whitsunday (Pentecost), Double. May 20: Whit Sunday (Pentecost) with an octave, Double of the I Class. May 21: Whit Monday, Double. May 22: Whit Tuesday, Double. May 23: EMBER WEDNESDAY/Whit Wednesday, Double. May 24: Whit Thursday, Double. May 25: EMBER FRIDAY/Whit Friday, Double. May 26: EMBER SATURDAY/Whit Saturday, Double. May 27: Holy Trinity Sunday, Double of the I Class. May 28: St. Augustine (of Canterbury), Bishop and Confessor, Double. May 31: Corpus Christi, Double of the I Class; Commemoration of Feast of the Blessed Virgin Mary, Queen, Double of the II Class; Commemoration of St. Petronilla Virgin.